Happy Holidaze y'all. 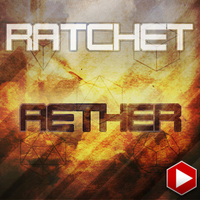 We have a free tune from Ratchet just in time for the New Year! West Coast arpeggios and subbed out basslines makes Aether a great tune to add to any set this year. 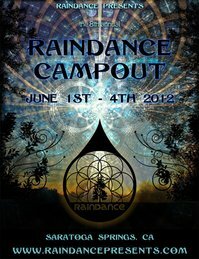 It's that time again... Time for the annual Raindance Campout! This years lineup is insane! 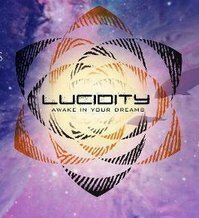 With an all star cast of musicians such as Opiuo, Quade, Vibesquad, Heyoka, Minnesota, Love & Light, Digital Rust, Phutureprimitive and NastyNasty. Also featuring Memekast residents, Spektrum, Dabis and Cumulus. 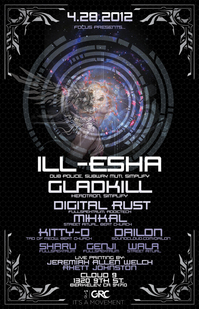 As well as past Memekast selectors Mihkal, Ana Sia, Kitty-D, Digital Honey, ill.Gates and SatsiSonik just to name a few. 3 Full Days of Music, Dancing, Art, Camping, Fun, Swimming, Hiking, Learning, Loving, Growing... with your favorite people! Performance, Workshops, and Visionary Forums information coming soon! We are limited to selling 600 tickets and we want you there, so please don't wait! We will open doors at noon on Friday and close at noon on Monday. Music will be nonstop. You know how we do! ABSOLUTELY NO DOGS! NO DOGS! NO DOGS!!! Please visit - Raindance Presents for up to date venue, vending, volunteer and all other information. We're starting at 7pm, Dinner will be served until 10pm for those of you wanting to get your night going early. We are also featuring some of our favorite local visual artists. Jeremiah Allen Welch and Rhett Johnston will be painting Live and showing many of their most recent works. We'll also be presenting our special Healing Sanctuary, featuring Tea Service by the one and only Evan & Bridgette. With musicians playing elevated beats to relax the body and mind. This is not a night to be missed! Electrocado was created during 2009 by Bill Day and Ryan Whare in Ol’ Sydney town. They combined generous amounts of psy, electro, glitch, minimal and progressive, spread some avocado on top, then grilled it till it was steamin' hot and crunchy. The result is a tasty and satisfying meal covering a wide range of tempo’s and musical influences. Mr. Rogers' brain is a fun place to visit, but you might not want to stay for too long lest you get stuck in the intricate, syncopated pulse that oozes from it. Mr. Rogers connects with dancefloors instantly with his totally unique style. His signature sound seeps out of every beat per minute, and latches onto your primal dance button. 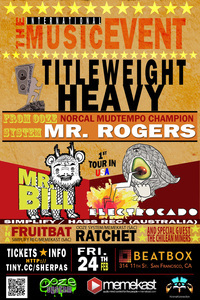 Mr. Rogers sounds have long captivated the West Coast underground arts community. Now the secret is out and this pioneering producer is poised to conquer the far reaches of the dance floor with his twisted, psychedelic take on bass-heavy midtempo and glitch-ridden breaks. Tha Fruitbatis an electronic music maker best known for his disorienting arrays of synth and sample tones, woven together atop complex breakbeats and mutated basslines. His background as a trained musician (drums, bass, guitar and percussion) and audio engineer enables Tha Fruitbat to play, sample and record and slice his own sounds into his compositions, creating his own unmistakably unique style and sound. 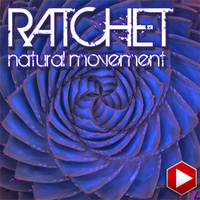 Ratchet has been cranking out a unique brand of twisted psychedelic breaks and mid tempo since 2006. Having showcased his talents in underground clubs and outdoor festivals, people are beginning to notice his impeccable ability to craft a sharp, precise, ultra-clean composition. 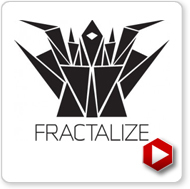 His first full length album, Warp Speed was just released on Ooze System and is currently holding steady on the Addictech charts. Fresh off the heels of his new Memekast giveaway "Natural Movement." 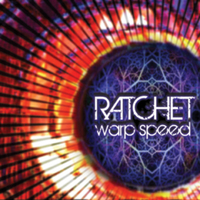 I'm excited to present Ratchet's new album "Warp Speed." Out now on Ooze System Recordings "Warp Speed" just charted as Addictech.com's #4 release of the year! You can get it right now, exclusively hosted on Addictech's digital store. For our second free giveaway for 2011/2012. 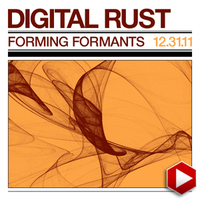 We bring you "Forming Formants," a slammin' tune from Digital Rust. A little something funky to ring in the New Year. We featured him last March on Memekast mk053. Which was in support of his then, new "Loophole EP," available on Addictech.com. When Loophole dropped it created quite a buzz in Mid Tempo and Glitch Hop circles. His music has been compared to Opiuo, Love and Light and even Tipper to name a few. Not to mention staying at #7 in the Addictech Top 10 since March. When we asked him for a freebie, little did we know that he would give us one of the most asked for tunes, from both his Memekast and his live sets. Forming Formants starts out with a bang and doesn't disappoint the whole way through. It's more or less, a relentless barrage of choppy vocal synth bits and moving, sludgy baselines. Combine that, with chunky hard hitting beats and the glassy 303 leads occasionally making their appearance at the forefront of the mix. 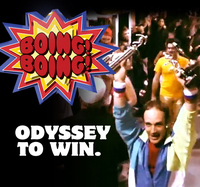 It has just enough pretty elements to provide a noticeable amount of contrast, for such a heavy danceable song. You can expect a new EP from Digital Rust in April, 2012. Until then, this will just have to do.